The following (in a slightly different form) was originally published in April 2011 on Victoria’s Posterous site. Republished by and with permission of the author. “Everyone’s entitled to their own opinion – but everyone’s not entitled to their own facts,” said my wise and handsome boyfriend during a Twitter debate yesterday about chiropractic. Let a physiotherapist do this. We'll all be better off for it. Then I started reading up on it. Yes, there is indeed a chance that getting your spine adjusted, especially in the cervical (neck) area will cause a stroke. Many people have been maimed by it, and yet the practice has still not been outlawed. My long-time chiropractor in Regina convinced me that the risk of stroke is so small as to be not worth worrying about. To give her credit, she was always very careful and checked on any symptoms of stroke before and after she gave me a treatment. But that’s not enough. Why risk a stroke during a treatment that has not been proven to have any benefit? So yeah, sure the risk of stroke is small – but if the benefit is nonexistent then taking that risk is irresponsible and unnecessary. I can’t for the life of me understand why health care practitioners are legally allowed to perform cervical spine manipulations. Mind. Boggled. Not all chiropractors make the wild claims that others do: that they can cure everything from your cold to your digestive problems to – get this – colic in your baby and even more serious health problems. 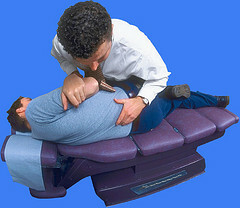 I have never seen a chiropractor who will not use quick movements to forcefully manipulate your spine. That’s why they’re chiropractors, that’s what they learned how to do – it’s the basis of their practice. Fact is: there has been no study proving the efficacy of chiropractic. None. Nada. Fact is: chiropractic is at best throwing your money away and at worst dangerous. The most benefit you’ll ever get from one is through the soft tissue manipulation: something a well-trained physiotherapist can do much better and much more safely. This is not a matter of everyone having their own opinions. It’s not chocolate versus strawberry ice cream. This is reality, and ignoring facts has real consequences. “Much of what chiropractors do is nonsense, and they often misinform their patients,” says this article, complete with references. Read it. You know you wanna. So you can still be of the opinion your chiropractor is helping you recover from your injury or your sore back. You can even pay him or her to do soft tissue manipulations. So what? Where opinion collides with fact is: chiropractors use manipulations that risk hurting people. The only reason they can do so legally is they have a well-organized lobby effort and high-priced lawyers. Where opinion collides with fact is: health insurance (whether government or private) is paying for unproven, risky treatments by chiropractors. So don’t tell me you’re entitled to your opinion when my health care dollars will pay for your rehab if you end up with a stroke — or worse: you’ll die. Don’t tell me you’re entitled to your opinion when my insurance and tax dollars go to paying your health care. By the way: my headaches are mostly gone since I stopped seeing chiropractors and started taking care of myself better: staying fit, reducing stress, the whole nine yards. I highly recommend the rational approach to health care: science-based medicine. Photo by doctorwonder, used under Creative Commons license. Many of us who are of a certain age came to skepticism via the magician James Randi (The Amazing Randi), who, beginning in the 1970s-80s, used his skills to uncover scam artists and sham psychics like Peter Popoff and Uri Geller. Every year his organization, the JREF (James Randi Educational Foundation) hosts the Amaz!ng Meeting (TAM) in Las Vegas. It’s an event I would very much like to attend one of these years. Perhaps that day is coming sooner rather than later, now that this YYJ Skeptics group and this blog have been formed. Because so many skeptics are not content merely to gather and talk skepticism and science (as fun as that can be), but instead are inclined to get to work together combatting the trends of unreason in society, a lot of planning and networking at TAM often results in new projects getting launched, such as the founding of new local skeptics groups, and the creation of grassroots activism campaigns, web initiatives, and numerous podcasts and radio shows focusing on skepticism and the speakers at TAM. I have heard from so many folks about amazing things coming out of the Amaz!ng Meetings. I think it would be great if a future TAM could see a delegation from Victoria BC attending. I counted about 25 people at this presentation, described on the YYJ Skeptics in the Pub Facebook group as lecture on wireless hydro meters. Patrick, Fiona and I were the (identified) skeptics in attendance. The lights were out when we got there, and stayed out the whole time we were there, which made it heard to take legible notes. I thought of using my iPhone, but I worried I might be asked to leave if I did. The emcee didn’t introduce himself, nor did he say which organization was sponsoring this event, nor did he give an agenda for the evening. At the front of the room a computer was set up to give a presentation. The background wallpaper on said computer was something about “chemtrails.” Patrick and I looked at each other and rolled our eyes. “It’s gonna be a fun night,” I thought. There was someone walking around monitoring something (radio frequencies I suspect) with a device. It seems this is a crowd that doesn’t go much for wireless technology of any kind. We wondered if they would zero in on our phones, but they didn’t. Turns out they wanted to show us a video from Google movies – which turned out to be a full-length “documentary” called Public Exposure: DNA, Democracy, and the Wireless Revolution (watch it if you truly have nothing better to do with your time). There was an URL given: energyfields.org. It turns out to be a defunct site that is now a holding page for all sorts of products that will shield you from nasty radiation of all kinds (Tin foil hats? Wait – they’re coming!). Film is about 10-11 years old. Latest date named in film is 2000. Radios, TVs, radar and microwaves emit energy over 10,000 times what we we were exposed to before all this technology came about, and “our cells are like antennas” catching them all. Shot of a baby’s crib. Dire music. A breast cancer survivor on why she got sick: “my hunch is military” i.e. radar stations. “Many wealthy people can afford all the toys. We’ve surrounded ourselves with toxicity,” says breast cancer survivor. “Scientists say…” (said many times; unnamed scientists of course). RFs are “oscillating fields” unlike the earth’s electromagnetism. That’s why they’re more dangerous even though of comparable intensity (Moving the goalposts fallacy). There is apparently a “Radio Frequency Sickness Syndrome.” More on that later. This was at the point in the movie where it got extremely strange. In demonstrating the debilitating effects of “electrosensitivity” they talked to a Swedish guy who’d taken to wearing a stainless steel suit complete with spacey headgear, all day every day. That was it for me, it was an hour into this “lecture” and I really had better things to do with my time. I would have liked to listen (politely) to what the people in the audience had to say, but I couldn’t wait for the gong show video to be over. The biggest problem with the video was the heavy reliance on the fallacy of “correlation equals causation.” It was simply asserted (many, many times) that because the increasing rate of cancers is correlated with increases in radio-frequency exposure (cell phone towers, radar stations, etc), therefore RFs must be causing cancer, or that because someone got a cell phone and held it to the right side of their head, that’s why they got brain cancer on the right side. Never mind the actual mechanism whereby this could happen has never been shown to exist, or that there are any number of factors that could cause clusters of cancer: the documentary even failed to show evidence that the cancer clusters in question really were epidemiological anomalies. If RF-emitting towers. Devices, etc really do cause cancer (or even “electrosensitivity”) why aren’t similar clusters found everywhere there are a preponderance of cell phone towers and radar stations? I left the screening at the tin foil hat – er – stainless steel suit guy and didn’t wait for the movie to end. I was followed by Patrick and Fiona, the real science journalist, who had confidently left her son playing games on her smart phone in another room of the community centre. We chatted for a while, then Patrick and I retired to the Beagle for a beer. We had already agreed we would try to take a low-key approach (it was hard to contain our chortling though) and be respectful of the people in attendance. However, we’re not sure we have the stomach to sit through incredibly boring pseudo-documentaries and then sit through the inevitable credulous discussion afterwards. We certainly have a lot of respect for the people who do. We vowed to be on the lookout for this kind of misinformation at public meetings like school board or city council, and make sure to provide rational voices to counteract the misinformation. Tin Foil Hat photo by EightK, used under Creative Commons license. “Chemtrails” photo by taomancer, used under Creative Commons license.